Groundwater dependent ecosystems (GDEs) are defined as ecosystems that require access to groundwater to meet all or some of their water requirements so as to maintain their communities of plants and animals, ecological processes and ecosystem services’. GDEs include a broad range of environments from highly specialised species and ecosystems that possess unique biotic and abiotic characteristics that ‘separate’ them from other ecosystems. GDEs can rely on groundwater for the maintenance of some or all of their ecological functions (Clifton et al. 2007). This dependence on groundwater can be variable, ranging from partial and infrequent dependence, i.e. seasonal or episodic, to total (entire / obligate), continual dependence. They can range in area from a few metres to many square kilometres. Diverse subsurface community of fauna that inhabit the pore spaces and voids of groundwater environments, termed ‘stygofauna'. Stygofauna include a broad range of organisms which include ‘macro’ invertebrates and vertebrates that can be seen with the naked eye, ‘micro’ organisms termed ‘meiofauna’ (invertebrates that can only be seen with a microscope) and bacteria (biofilm) communities. They have many values, including the following: some are rare or unique; the ecosystems surviving in aquifers and caves are amongst the oldest surviving on earth; and they have water quality benefits, biodiversity value and add to the ecological diversity in a region. These are cavities in rock that act as a conduit for water flow between input points, such as stream sinks, and output points, such as springs or seeps. A karst is a specialised form of cave that are formed by the greater solubility of certain rocks in water. Most karsts form commonly in limestone and other carbonates such as dolomite, however also include evaporites such as gypsum and halite, silicates such as sandstone and quartzites, and in some basalts and granites caves in general can form in many types of rock through other processes other than solution. All can support aquatic and terrestrial ecosystems. Are streams supported by groundwater discharge or spring fed. It is these that sustain flows in many streams during dry times. Understanding the interactions between groundwater and surface water is fundamental to understanding and managing the chemical and biological characteristics of streams throughout their lengths. River base flow ecosystems include a combination of subsurface and surface ecosystems depending on the structure of the river bed sediments. Groundwater base flow in sand-bed and gravel-bed rivers support both riparian vegetation and in-stream macrophyte communities, surface water aquatic invertebrate communities, and a specialised community of invertebrates (termed hyporheos) that exist below the river bed / substrate surface in the hyporheic zone. Phreatophytesdo not rely on the surface expression of water for survival but depends on the subsurface presence of groundwater, often accessed via the capillary fringe (i.e. the subsurface water just above the water table that is not completely saturated). Phreatophytes include both deep and/or shallow rooted vegetation communities. Forests and woodlands can rely on groundwater for survival, particularly in areas of shallow groundwater. The degree of groundwater dependence can vary, the literature indicating seasonal variability in both the quantity of groundwater used and the relative importance of groundwater as a water source. Wetland ecosystems can depend on groundwater to keep them seasonally waterlogged or flooded e.g. paperbark swamp forests and woodlands, swamp sclerophyll forests and woodlands, swamp scrubs and heaths, swamp shrublands, sedgelands and mound springs ecosystems. Groundwater dependent wetlands exist at the boundary between surface and groundwater systems. They facilitate the flow of water between the groundwater system and the surface-water system. Groundwater dependent wetlands can be found in the mountains, on the plateaus and high plains, in river valleys and in coastal lowlands. Many estuarine and near-shore marine systems depend on groundwater discharges to provide suitable habitats for a diverse group of flora and fauna e.g. coastal lakes, mangroves, saltmarshes and seagrass beds. They can be separated from coastal wetlands by the reliance on seawater and tidal influences and groundwater discharge may be in the form of direct off-shore discharge zones called ‘Wonky Holes’, diffuse discharge through sandbeds or baseflow into streams that discharge to the ocean. Conceptual GDE model – the following diagram shows where the various types of GDEs are located in the landscape for inland and the coast. The groundwater dependence of ecosystems can range from complete to partial reliance on groundwater, such as might occur during droughts. The degree and nature of groundwater dependence will influence the extent to which they are affected by changes to the groundwater system, both in quality and quantity. Ecological processes in groundwater dependent ecosystems are threatened by the regular extraction of groundwater and changes in land use or management. Species and communities that require permanently wet conditions, particularly in arid, semi-arid or seasonally dry conditions are more likely to be groundwater dependent than those tolerant of a regular cycle of wetting and drying. In order to manage GDEs, it is important to firstly understand where they are located, as well as their level of groundwater dependence. A mapping project has been completed to identify vegetation communities that have a high probability of being groundwater dependent. The protection of GDEs in water sharing plans is restricted to those considered as high priority as their protection needs to be balanced with the demands on groundwater by licensed users. The assignment of an ecological value to GDEs allows management needs to be prioritised. 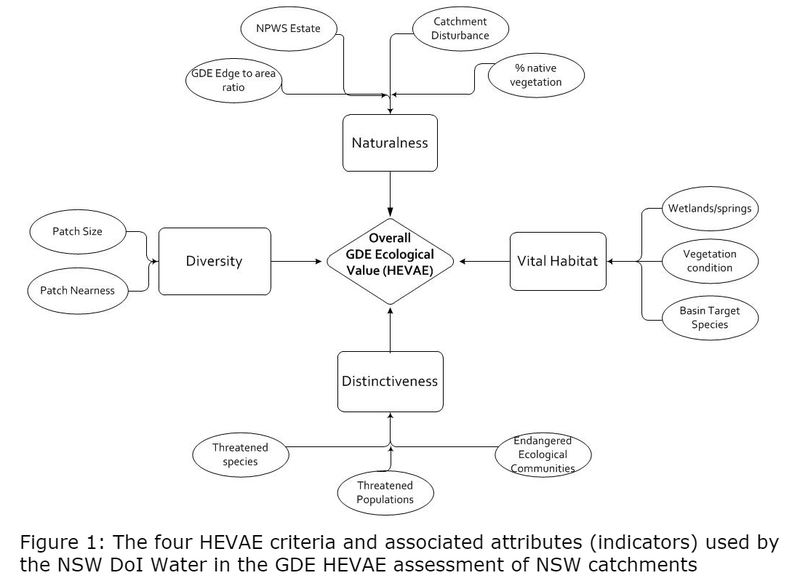 To assign a value to individual GDEs, NSW has adopted the high ecological value aquatic ecosystem (HEVAE) framework. The Overall GDE Ecological Value (HEVAE) diagram ((JPG 213.9 KB)) summarises the data used for each of the HEVAE criteria. The “representativeness” criteria was not applied to the dataset due to insufficient data being available. Changes in water quantity, either by the decrease in groundwater levels through extraction to meet the needs of agriculture or industry, or increases in groundwater levels through land clearing are threats to GDEs. Either lowering or increasing groundwater levels has the potential to cause a change in GDE community structure. Urban, commercial and tourist developments as well as intensive agricultural land use can adversely affect groundwater quality and, therefore, the ecosystems that depend on that groundwater. Changes in water quality caused by the following can occur: nutrients from fertilisers and septic tank effluent, salt intrusion, agricultural pesticides, metals and hydrocarbons from commercial and urban land uses (e.g. leakage from underground fuel tanks, can contaminate groundwater). Exposure to such contaminants can pose a direct short and long term threat to the ecology of GDEs.